Why Can I See WooCommerce Content Without Unlocking Private Store? Is the WooCommerce Private Store plugin active? – Go to the Plugins page in WordPress and check the plugin is active. Is your license key active? – The plugin will only work if you have a valid license. Go to WooCommerce -> Settings -> Products -> Private Store and make sure your license key is activated successfully. You should see a ‘tick’ and a message which says “License key successfully activated”. If it’s not active, try deleting and re-entering your license key, or check the section on license key problems above. Have you accessed your private store recently? – If you have unlocked your own WooCommerce store recently then a cookie has been stored in your browser giving you continued access. This will automatically expire after a set period (see plugin settings) and you will need to re-enter your password to regain access. To check how your hidden store will appear to other users, use a different browser or open an ‘Incognito’ tab. Have you ticked the box to allow access to administrators without a password? 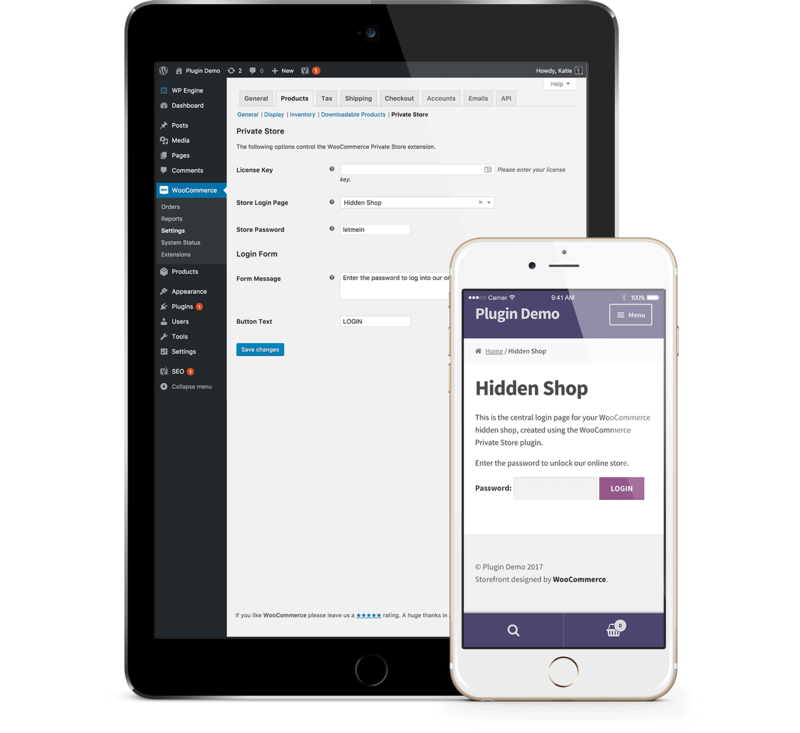 – Please check the plugin settings at in WooCommerce -> Settings -> Products > Private Store. If you have ticked the box for Logged In Users then you will be able to view WooCommerce content without entering the password. Untick the box or try a different browser to see what your guest users will see. WooCommerce Private Store will hide all the menu links to your store. This includes links to the main shop page, products, product categories, cart, checkout and account page. Have you selected the page in the WooCommerce settings? In order to use a page as your cart, checkout, account page, etc., you need to select it in the main WooCommerce settings. For example, you need to select the cart and checkout pages in /wp-admin/admin.php?page=wc-settings&tab=checkout and the main Shop page in /wp-admin/admin.php?page=wc-settings&tab=products&section=display. If you haven’t done this, then WooCommerce Private Store won’t know to hide these pages. Are the pages added to the menu correctly? If any of the menu links aren’t being hidden, please make sure that you have added the menu links by selecting the page in the ‘Pages’ section of Appearance > Menus. WooCommerce Private Store can only hide WooCommerce pages that are added in this way. If you have added them as Custom Links instead, then they will not be hidden. Are the pages added by plugins other than WooCommerce? WooCommerce Private Store only hides pages added by the main WooCommerce plugin – i.e. your main Shop page, product categories, product tags, products, cart, checkout, and account page. If you’re using other plugins such as a WooCommerce Add to Quote or Wishlist plugin, then the pages created by these plugins won’t be hidden by WooCommerce Private Store. The simplest solution is for you to remove the link to this page from the menu and instead, add it to a sidebar widget that will only appear on your WooCommerce pages (e.g. product or category pages). That way, the link to the page will only appear for people who have already unlocked the private store.